Originally developed by Charles Gahagen, the engine has only two moving parts. The inventor boasted an amazing 50% thermal efficiency (this has been improved upon recently). Diesel has an efficiency of only 40% and the four cycle gasoline engine is the least efficient with a thermal efficiency of only 30%. The secret of it's amazingly high efficiency lies in it's design. 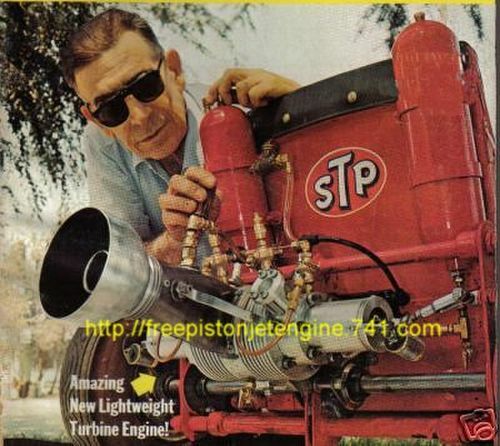 Each stroke produces power, a four stroke engine of similar displacement only produces a fourth of the power and is terribly complicated and heavy compared to free piston engines. The operational characteristics of free-piston engines differ from those of conventional, crankshaft engines. The main difference is due to the piston motion not being restricted by a crankshaft in the free-piston engine, leading to the potentially valuable feature of variable compression ratio. Simple design with few moving parts, giving a compact engine with low maintenance costs and reduced frictional losses. The operational flexibility through the variable compression ratio allows operation optimisation for all operating conditions and multi-fuel operation. The free-piston engine is further well suited for HCCI operation. we may make revisions at anytime, check back often! Check out the history of the FPE in print. Modern applications of the free-piston engine concept include hydraulic engines, aimed for off-highway vehicles, and free-piston engine generators, aimed for use with hybrid electric vehicles. Once again engineers have turned to turbines to tap the power of FPE. 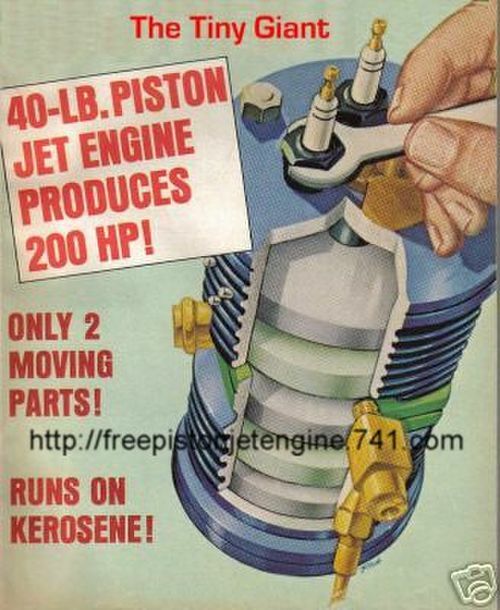 Instead of using the gas generated by engine, engineers have hollowed out the piston and shaft and filled the empty spaces with hydraulic fluid. The fluid is kept moving in a single direction without the need for valves or other mechanical implements. The moving fluid in turn drives a turbine. You may be wondering how this revolutionary turbine works. Flow is achieved by the shape and the reciprocating action of the piston. No valves or mechanical implements are used to restrict or control the flow of hydraulic fluid. The advantages of this system are cooling, lighter components, fewer components, All Wheel Drive (AWD) possible. Today's Direct Hydraulic Output automotive installations the hydraulic fluid and surrounding air provide all the necessary cooling. Such engines perform equally well throughout the year without the need for antifreeze solution. By doing away with power robbing pumps to circulate coolant more power is diverted to drive other useful devices such as bigger generator or air conditioning pump. Those unsightly radiator grills will also become a thing of the past, engineers can then design more streamlined, sportier looking cars. Gas turbine are very large and mostly built of exotic metals or ceramics to withstand high temperature. Hydraulic turbines can be built of almost any type of material including composites and are very compact when compared with equally rated gas turbines. Unlike gas turbine which must be coupled with transmission hydraulic turbines have enough torque to drive a wheel without the need for complex gear boxes. The picture on the above shows a typical 2 Wheel Drive installation with shaft extending both ways. Notice the Continuos Velocity (CV) Joints? An AWD could do away with CV joints and heavy shafts by bolting directly to the wheels. Such a system would have greater ground clearance than current vehicles by doing away with the differential and drive shafts. Less parts promotes reliability, lower maintenance costs and lighter cars. The entire drive unit is so small and flexible, engineers can install the motor anywhere on the vehicle. Likewise most backyard builders can also remove and reinstall to create custom (kit) cars. Research into this technology is led by Stetzer Motors of Germany.